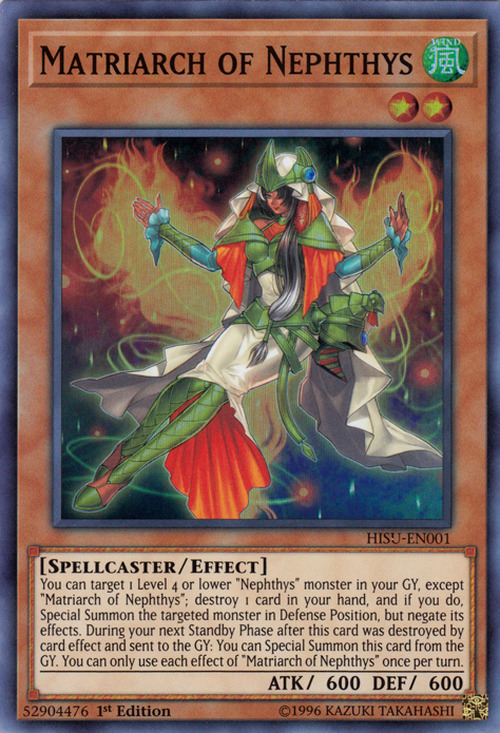 You can target 1 Level 4 or lower “Nephthys” monster in your GY, except “Matriarch of Nephthys”; destroy 1 card in your hand, and if you do, Special Summon that target in Defense Position, but negate its effects. During the Standby Phase of your next turn after this card was destroyed by a card effect and sent to your GY: You can Special Summon this card. You can only use each effect of “Matriarch of Nephthys” once per turn. 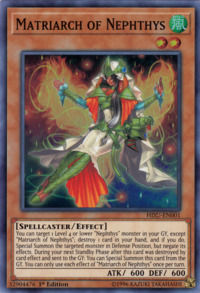 This monster appears in the card artwork of Nephthys, the Sacred Preserver, Rebirth of Nephthys, and Last Hope of Nephthys.